Summertime means a lot of different things to all of us. For me, I enjoy being elbows deep in peach juice. The East Coast isn't quite like the West when it comes to access to produce, so stone fruit is something I look forward to year after year. Something I did not grow up with is burrata. But no worries, I'm making up for lost time. What is burrata? Burrata is a lot like fresh mozzarella, but with a cream filled center. Once you cut through the skin of the cheese, the oozy center flows out. It's so simple, yet indulgent. 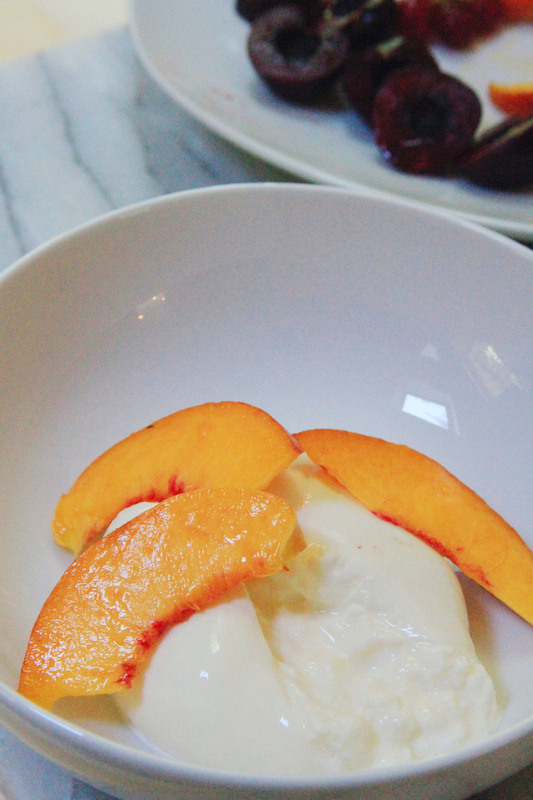 And I think burrata goes really well with stone fruit. So try putting it together. You don't need this exact combination of fruit, but see what's new at your supermarket + try them out in this quick recipe below. Place the burrata in a bowl (you can also split this between two bowls like I did!). Split the burrata in half, allowing the center to ooze out. Top with the peaches, cherries + currants. Pour the balsamic over everything + garnish with fresh mint.